Established in 2013, EverydayHappy is the result of an intense collaboration between all of their different talents. They put all of our energy into researching, testing and refining their products, then they did it all over again until they were satisfied. Our kids can’t read labels, so it’s our responsibility to make sure they’re only exposed to safe, natural ingredients. By living mindfully, they’re making life truly meaningful for our kids. What they’ve built is a promise — to make every day happy for them, and for those who want to join them. See what Emilee at Pea of Sweetness thought of the EverydayHappy Home Care Products. 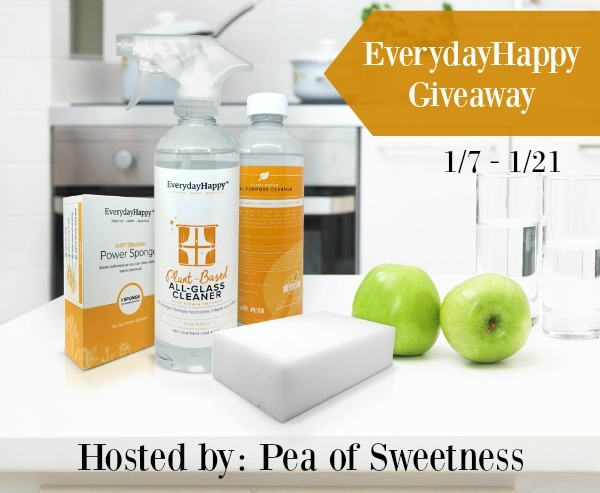 Would you like to win EverydayHappy Home Care Products? One winner will receive All-Purpose Cleaner, All-Glass Cleaner and a Power Sponge! This giveaway runs through 1/21/16 at 11:00pm Eastern Time and is open to US residents ages 18+. Winner is subject to eligibility verification and will have 48 hours to confirm before a new winner will be drawn. For any questions/concerns please email emilee.roberts (at) peaofsweetness (dot) com (consider adding this email to your “Safe List” as winning email notification will be sent from this email). Please refer to the full terms and conditions in the Giveaway Tools. That they are safer ingredients – I have twin grandbabies coming this spring and want to make sure my home is clean and safe for them. Always interested in new products that are safe to be used around my children. Safe, natural ingredients would make me happy every day! I like that is is safe and can always use cleaners.